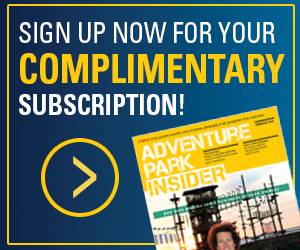 As we continue to grow as a resource for the adventure park industry, we are pleased to offer our first annual Adventure Park Insider Resource Guide. This resource guide is in response to the many operators who have asked us for information on builders, designers, suppliers, and consultants that serve their businesses. To that end, the Resource Guide will include a comprehensive Supplier Directory to help connect buyer and seller and the complete findings and analysis from the 2017/18 Industry Survey Report . The Resource Guide will be shipped along with the Spring issue and be available online. Readers will learn about industry trends in capital improvements and services—among a host of other data—and quickly reference providers of products and services that can help them keep up or stay ahead of the trends. The directory will be a year round resource for operators across North America and globally. 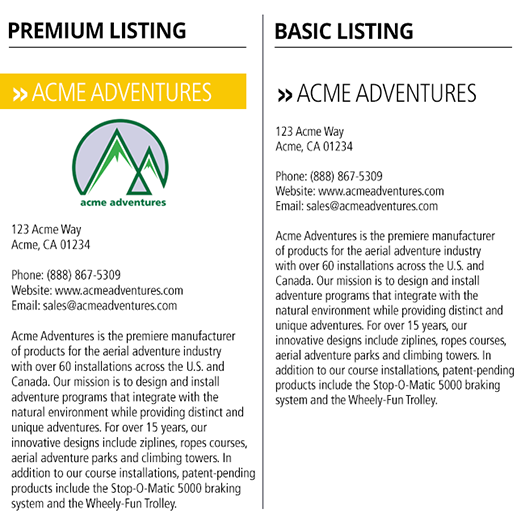 We will offer two opportunities to list your product or service in this Resource Guide—Premium and Basic listings*. See the examples below. We also a limited number of advertising positions for those seeking to stand out a bit more from the competitors. Contact sharon@adventureparkinsider.com if you have any questions.